QR Mobile Data will help you become more productive and efficient if your business workflow requires collecting data, filling out forms, track processes and keep records / documentation. Here we discuss several most common scenarios and the best way to set up QR Mobile Data to accommodate them. If you are in the equipment installation / servicing business, or need to track maintenance of the internal assets and equipment, QR Mobile Data will help you streamline the process and keep equipment maintenance documentation in order. Enter assets and equipment into the system, and label them with the unique QR code. If you have several groups of equipment with different maintenance requirements, fill out Group field when entering equipment. Dividing equipment into groups allows you to create different set of forms for each equipment group. Transfer your current forms into the system (see how to create mobile forms for details). If you have similar forms, use copy existing form option to speed up the process. This will copy all fields from the selected form. You can then change / add / delete fields as needed. Use clarifying text and / or image options - this will allow you to show an employee exactly what part needs to be checked, replaced, etc. For preventive maintenance forms you may want to specify form submission cycle. Form submission cycle indicates how often you need to do this type of preventive maintenance (e.g. each 30 days). Specifying form submission cycle will allow you to receive automatic e-mail alerts when next preventive maintenance is due. Use custom fields to enter all information on the equipment that technicians should be able to review in the field. Use image / pdf field(s) to upload images, drawings or pdf documents. Field technicians will be able to access uploaded documents and equipment information in the field on their smartphones by scanning equipment QR code label. Specify basic equipment information that you want to appear on the filled out forms / pdf reports as a part of the equipment record. This information will be included in the completed forms automatically - your field technicians won't need to enter it each time they are filling out the form. You can make the work of your field technicians easier and faster by pre-filling general information in the form online (if applicable), then push partially filled form to the mobile devices. This way field employees will only need to fill out parts specifically related to their work. Pre-filling forms and pushing them to the mobile devices has an additional benefit: your field technicians will see the list of the forms that need to be filled out. As each form is completed and submitted to the server, it is deleted from the pending forms list on all mobile devices. In most cases you will not need to create or use a workflow. 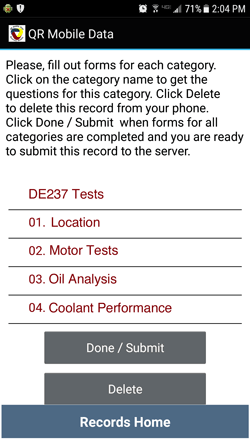 Use stand alone mobile forms for recording equipment maintenance and service. However, if you require different technicians to perform different parts of the job, than workflow will be beneficial. If this is the case, create workflow steps and a separate mobile form for each part of the job, attach each form to the corresponding workflow step. This way each technician will perform his part of the job, fill out corresponding form, and move the project to the next step for the next technician to take over. You will be able to review the whole process, dates, employees, and filled out forms in one report. If you need to provide reports to the clients and / or external auditors, than a document module will be very helpful. Document module allows you to create custom pdf reports for each completed form, in the field on a smartphone or in the office via a web dashboard. You can e-mail reports to the interested parties, print them out or upload to the client's server. You can define what is included in the reports, reports look and layout by creating custom report templates. QR Mobile Data will help you track manufacturing projects, collect necessary documentation on the shop floor using mobile devices and barcode scanning. For tracking production processes, creating workflows is an important part of the setup. Create a separate workflow for each process type. Use description for general workflow and each step to let your employees know what needs to be done on each step. Create a separate mobile form for each inspection, checklist, quality control or data collection that should happen during the process. Attach each form to the right step. If the same form needs to be filled out for the different processes / on the different stages of the same process, you do not need to create duplicates. You can attach the same form to as many processes / workflow steps as needed. If you need to track lot numbers / batch numbers / serial numbers of the used parts and materials, create scan fields to capture this information. This way employees will be able to scan in lot numbers / serial numbers with a smartphone, instead of entering these long numbers manually. It will not only speed up the process, but also ensure that there are no mistakes which can be easily introduced with manual entry. Use QR Mobile Data notification mechanism to notify the right employees when the project is moved to the next step. This will keep everyone involved in the loop and will help you avoid delays and miscommunication. If you are using QR Mobile Data together with QR Inventory, add project number and workflow step to the fields that need to be filled out during inventory transaction. This will allow you to link inventory transactions to the process, and have all project data: history of movement through the process stages, dates, employees, actions, completed forms and inventory transactions in one place. If you need to perform any kind of field inspections: equipment safety checklist, food safety inspection, rental properties audit, restaurant compliance inspections, facility walk-through, etc., etc. - QR Mobile Data will help you make this process faster, more efficient and error free. Your employees will fill out inspection forms on the mobile devices, and you will have access to all collected records in real time. Inspection documentation will be stored in a secure centralized cloud location for on demand access by all authorized employees. Divide inspection scope into smaller chunks: areas to inspect, equipment parts, etc. 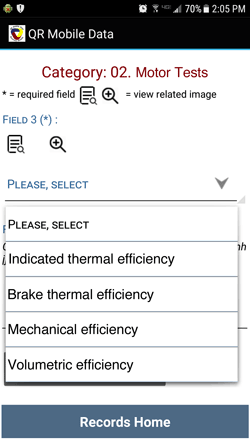 When creating an inspection mobile form, select appropriate category for each field / question. For example, for a restaurant inspection form you may have 5 questions related to the customer area, 7 questions related to the kitchen, 6 questions related to the bathrooms, etc., etc. When employees conduct an inspection, they will have a list of categories / areas, and fill out separate subform for each area. Such subdivision makes the form more comprehensive and much easier to complete than one long form. Make the forms in the checklist style whenever possible. Use dropdown lists, checklists and / or radio buttons to allow employees select an answer rather then do manual entry. If you make forms in this manner, it will be easier for you to analyze / process, and easier for your employees to fill out. Use manual entries only if you want to allow a space for notes / comments. If you make inspection / audit form using Yes / No selection, you will be able to review data from multiple objects / locations on a grid. This will allow you to quickly spot problem locations / areas with the No answers. Take advantage of the clarifying text / images to explain / show your employees what exactly needs to be checked and how. Add image fields to the form, so that your employees could take a picture that demonstrates the problem. If you need to create multiple forms that are very similar, use duplicate form option to copy an existing form with all fields, than add / update / delete fields as needed. Often your internal business operations include routine procedures that are performed on the assets, properties or other objects. The good example of this can be an orchard, where you need to keep track of the trees pruning, fertilization, harvesting, etc. Another example can be a property management company that needs to perform properties maintenance, cleaning, asset audits on the regular basis. A hospital may need to keep track and document cleaning of wheelchairs, stretchers and beds. Whatever your procedures are, QR Mobile Data will allow you to keep an accurate track of them and make sure that nothing falls through the cracks. If your primary goal is to document the fact that a procedure had been performed, when and by whom, you do not need to create a separate mobile form for each procedure. Create a single form, where a user will select a procedure name from a drop-down list, and possibly enter comments or add an image. The date of the procedure, as well as a name of an employee who performed it will be saved automatically. If you need to collect an additional information for each procedure, create procedure-specific mobile forms with all necessary fields. If you have related procedures that need to be performed in a certain order over a period of time (e.g. each month or each year), then creating a workflow will be beneficial. It will allow you to document / verify that all steps were completed timely and in the correct order. If you just need to keep track of one procedure (e.g. cleaning of wheelchairs and stretchers in the hospital), or procedures are not related to each other and can be done in any order, than stand alone mobile forms will be a better choice. Consider grouping together individual objects for which you perform the same procedures. For example, in an orchard, you may track procedures for the entire row of trees rather than each individual tree.